Use the best available tools to narrow down the best plastic sheet material for your application. What are the best methods to pick the proper plastic sheet material? The first tool suggested is a chart produced by the IAPD (International Association of Plastic Distribution – http://iapd.org/) linked in picture below, and listed on this chart are the most common plastic sheet and plastic rod materials that are commonly available. 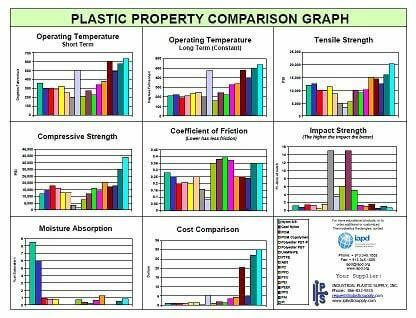 In addition, the chart compares the physical properties of these common plastic materials. Click on picture to access chart. Included in this chart is a relative cost comparison, which will assist in limiting the materials to proper plastics for a application without over-designing and using an expensive ‘over kill’ material. Some common plastic sheet materials can be very expensive. Materials like PEEK (Polyetheretherketone) can be in the $100 per pound range or more. recipe for disaster. Pick a material that can handle the temperature first. The most common colors in many plastic sheets are Natural (white to tan) and Black. While other colors are available with a special run, this may require a large minimum order. Some plastics, like HDPE are available in many colors and textures for use in marine, playground and food processing applications. 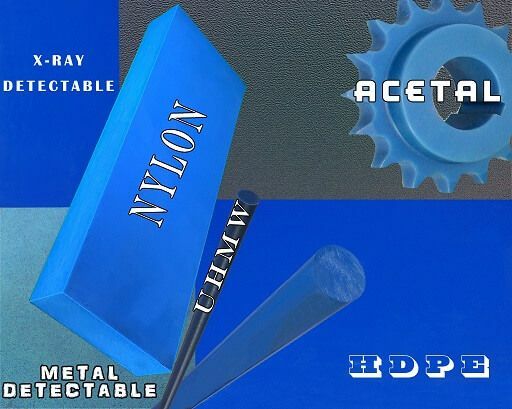 In many plastic applications, a machined part is being made, and the color is the least important factor. If it is an internal part of a machine, no one really cares about the color of the part. Some clients look for materials in a specific color to help ‘brand’ their parts for easy replacement and identification. water absorption. If your part will be exposed to crushing pressure, pulling apart force or impact, these are critical things to consider prior to picking your plastic part. PTFE is a soft and slippery plastic, but will ‘cold flow’ under high pressure, and High Pressure Laminates like G-10 FR 4 sheet can withstand some of the highest pressures. The Notched Izod tests for materials that break easily if a scored mark has been made in the surface. Acrylics break very easily if scored, but UHMW will not break at all under the same test. Sanitation Foundation) approved. These agencies insure that materials are rigorously tested and comply with their requirements for safety. Some common materials used in food processing that meet the FDA certification are Delrin – Acetal, HDPE, UHMW and Nylon, plus many others. Also see the article, New Methods To Pick Proper Plastic Sheet Materials, for additional information on this subject.